Ogilvy, a beaver, was lazily swimming in the river. It was time for his nap so he was looking up at the reed-lined riverbank, trying to find a spot that looked comfortable. He spotted a patch of bright purple growing among the dull brown reeds. "Hmmmmm, that looks soft, and the purple is rather pretty," Ogilvy mumbled as he climbed out of the water. He waddled up the muddy bank and laid his furry body down. The soft, silky, brushy, purple thistle felt so soft. He just couldn’t get comfortable, so he rolled over on his side. All of a sudden, he screamed out loud, "Ouch!" He parted the thistle with his jaw and saw the hiding prickles. "Thistle?" he called out. "I’m out of here," he said, stood up and started walking towards the muddy bank. "Eech, ooch, ouch. Eech, ooch, ouch," he complained as the sharp prickles poked the delicate bottoms of his feet. When he finally reached the mud, he breathed a sigh of relief and slipped back into the water. Using his strong tail, he swam down the river and out of sight. Maisie, a red deer, was prancing through the tall grass, on her way to the river to get a drink of water. She bounced high as she leapt and frolicked along. When she got to the river, she looked nervously about to make sure there were no crocodiles lurking under the water near the shore. After feeling safe and secure, Maisie slurped up enough water to quench her thirst. Feeling sleepy, she looked around for a place to lie down. She spotted a patch of purple thistle and walked over to it. "What beautiful, soft looking, purple flowers," she said. She sprang over to them and began to lie down. That’s when the first prickly thorns poked into her soft hide. "Ouch! This must be thistle!" she called out. "Eech, ooch, ouch! Eech, ooch, ouch!" she cried as she made her way out of the thistle to the muddy riverbank. Maisie decided that she wasn’t that tired and ran off towards the woods, passing Murdock, the tortoise. Murdock watched as the deer zoomed by and then made his way towards the river for a swim. He slid into the cool water and swam around. He dove down to the bottom and ate some moss off a rock and chased a trout through some reeds growing up from the riverbed. When he was finished with his swim, he made his way up through the slimy black mud, looking for a place to lie down and rest. He spotted the purple patch hidden among the thick cluster of reeds. He went over to it. "This purple flower looks like a carpet of soft feathers," Murdock thought. He walked on top of them into the middle. Just as he was getting comfortable, some of the thistle’s prickly stems and leaves poked his tail, then his four feet, then his face and neck. "Ouch!" he exclaimed. He pulled his feet inside his shell. "Hmmmmm. How am I going to get out of this one?" he wondered. He had no choice but to walk on the prickly plants. "Eech, ooch, ouch! Eech, ooch, ouch!" he cried out with each delicate step. When he reached the soft, prickle-free dirt, he stood and watched as a beautiful bright yellow butterfly with red spots came fluttering past his nose. 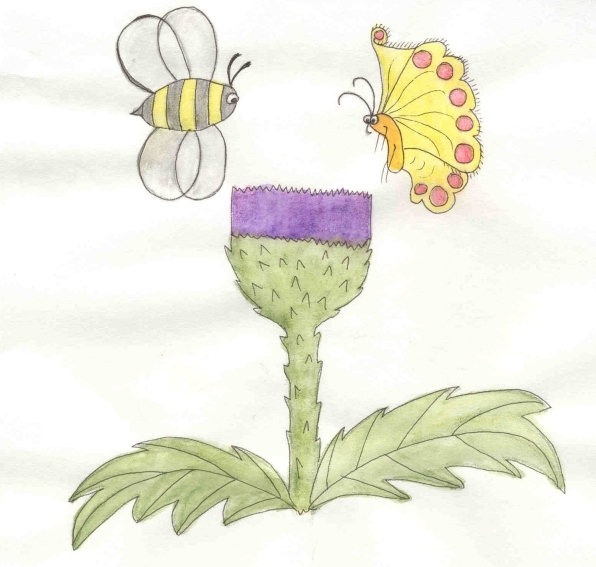 It landed on the purple thistle. Murdock noticed that Leslie didn’t seem to be bothered by the prickles. She fluttered from flower to flower, gathering pollen on her legs and proboscis. Soon Ross, the bumblebee, buzzed by. Murdock watched as Ross gathered pollen from the thistle, just like Leslie had and he didn’t seem to be bothered by the sharp prickles either. From then on though, Murdock, Maisie and Ogilvy found somewhere else to eat and were always much more careful before they would lie down on patches of pretty purple flowers.